I like your hexie idea. I love your husband’s involvement in your quilt. This will be a great project! Awesome project. I love quilts with a hidden meaning. Are you using average daily temperature or high/lows? So THAT is what your hexies were for! Great idea. I haven't googled temperature quilt yet but wonder if you will just do one year or more to make a bigger quilt. Cool! Can't wait to see your progress. I am doing on as well.......got it all laid out in a box. I was unhappy with my choice of place to get the temps from, but I will work that out and get january done soon. I love your hexies! Great idea! I'm doing this using square-in-a-square blocks. I'm going to Weather Underground and using their History tab for actual daily temperatures. Very helpful! I've seen people do the week as a hexie flower, but then they are faced with choosing something to join them all together. I like your straight line better. A temperature quilt is definitely on my to-do list. Yours is going to be so pretty. Looking forward to seeing the progress. High, low or average? One glance tells me you live in a warmer place than me. I've seen this done as a knit scarf. Love the hexies idea! What an interesting idea. I bet it ends up really fun! Love it.It would be great to see the same thing from different places. It is summer here now and in winter it rarely gets below 50 degrees Fahrenheit so I would end up with a very different quilt. Patty, I have never heard of a temperature quilt. What an interesting project! Oooh, fun idea! I saw a temperature afghan recently and thought it looked neat, but didn't think about how I could translate that into a quilt. Can't wait to see how it turns out! Great idea. Can't wait to see how it progresses. Thank you, thank you for posting this: I've never heard of "temperature quilts" previously, and my husband is a "weather man" so will love working on a project similar to yours with me! 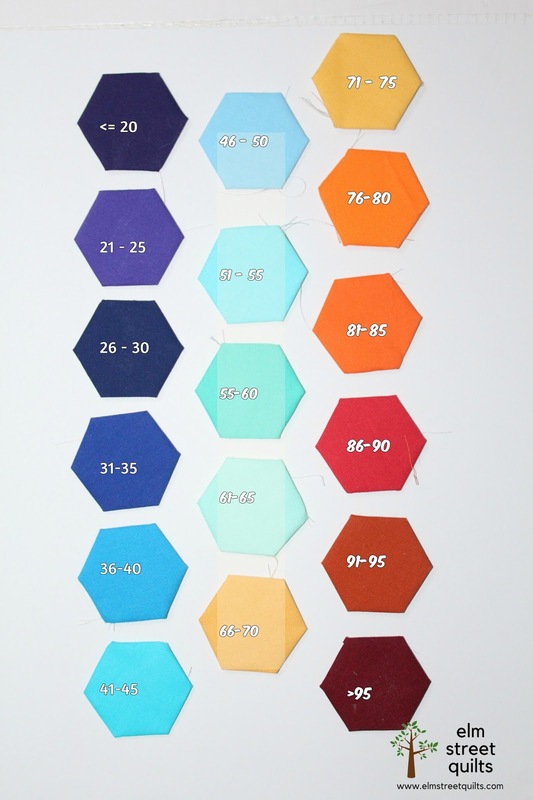 Those little hexies are adorable and will look amazing in your temperature quilt. I can't wait to see how it looks at the finish! Never heard of temperature quilts before ! I'm looking forward to following your project. The colour combination is really interesting by the way. That is a great idea! I have trouble remembering to record the High and Low in my Bullet Journal! This would be fun! You've got a great start on this project. I really like your color chart for this one. Oh I really like this idea. Can't wait to see it after several months. I bet as a big whole year quilt it will be spectacular. Wish I had the time to do one too. Hexie temperature quilt is such a fabulous idea, and it's great that you have an expert to help you with the colours. An Atmospheric Scientist - how amazing! Never heard of a temperature quilt before. Off to go google! Sounds like a neat project, regardless. What a novel idea! I may try this next year! I'd like to know the answers to some of the above questions too.